David Zeisberger, by John Valentine Haidt, 1771. In the atmosphere of Indian-hating that pervaded Pennsylvania during the last half of the eighteenth century, two religious groups stand out for their treatment of the Native Americans as fellow human beings worthy of respect and friendship. 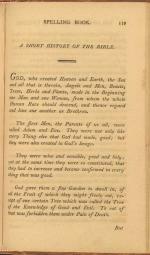 The Quakers often invoked the memory of William Penn to defend their insistence on applying pacifist principles to Indian relations. During the Seven Years' War, Quaker merchant Israel Pemberton formed the "Friendly Association for Regaining and Preserving Peace with the Indians by Pacific Measures." Informally known as the Quaker Friendly Association, this organization conducted a shadow diplomacy with the Indians while Pennsylvania's governor and assembly pursued more militaristic measures. Power of Gospel, by Charles Schussele, 1862. The other religious group committed to seeking peace was the Moravians, a German pietist sect that made Bethlehem, Pennsylvania its headquarters for missionary work among Native Americans. The Moravians came to Pennsylvania in the 1740s and quickly established missions in the Hudson, Delaware, and Susquehanna Valleys. By learning Indian languages and customs and marrying into native families, the Moravians formed personal alliances with the Iroquois, Delaware, Mahican, and other tribes. During the Seven Years' War and the American Revolution, they were indispensable to colonial governments as interpreters and mediators. Like his contemporaries Christian Frederick Post and John Heckewelder, David Zeisberger was a Moravian who spent a considerable part of his adult life traveling and living among Indians in Pennsylvania and Ohio. 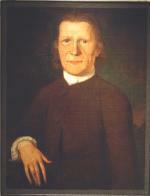 His family was among the first settlers of Bethlehem, and in the 1740s, Zeisberger accompanied Pennsylvania interpreter Conrad Weiser on diplomatic embassies to the Iroquois of New York, where he learned the Onondaga language. In 1763, he turned his energies to the Delaware, helping to establish the mission community of Friedenshutten in the Wyoming Valley. The influx of Connecticut settlers into the northern Susquehanna Valley endangered the Moravian mission communities there. Even though the inhabitants of these communities were Christians and shared the Moravians' pacifist principles, whites of this era tended to view any Indian as a treacherous savage worthy of extermination. 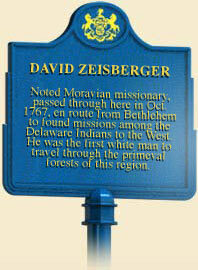 Zeisberger, therefore, became a significant figure in the Delaware migration out of Pennsylvania. In 1771 he established the mission town of Schoenbrunn in the Tuscarawas Valley of the Ohio Country. The success of this community led quickly to the founding of several more in the same region: Salem, Gnadenhutten, and Lichtenau. The converts who joined these communities paid a high price in terms of their cultural heritage. The Moravians expected their converts to don European clothing, give up war-making and native religious customs, accept biblically-mandated marriage and sexual practices, and work on farms planted in the European manner. Nevertheless, some Indians found it a deal worth making, because of the Moravians' commitment to treating them as spiritual equals and guaranteeing their security against marauding whites. During the American Revolution, the same pressures that forced the dispersal of the Moravian Delaware in the Susquehanna Valley undermined their security in the Ohio Country. The British at Detroit arrested Zeisberger and his assistant Heckewelder on suspicion of treason. The two missionaries were able to acquit themselves of the charges, but in their absence, Pennsylvania militiamen attacked Gnadenhutten and murdered its 96 unarmed inhabitants. After the Revolution, Zeisberger and the remnants of the Ohio mission communities picked up and moved again, this time into the Michigan Territory and Ontario, Canada. After Zeisberger's death in 1808, the westward migration of the Moravian Delaware continued across the Mississippi River and into Kansas. Zeisberger's life illustrated the circumstances that led to the dispossession and dispersal of Pennsylvania's native inhabitants, even those who embraced Christianity and the customs and habits of white society. 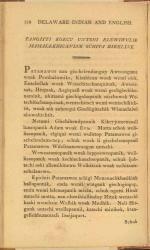 One of the manuscripts Zeisberger left behind when he died was a four-way dictionary for the English, Onondaga, Delaware, and German languages. While such a tool would have been very helpful to a traveler in Pennsylvania in 1750, it was regarded as little more than a curious antiquity by the early nineteenth century. Earl P Olmstead, Blackcoats among the Delaware: David Zeisberger on the Ohio Frontier (Kent, OH: Kent State University Press), 1991.